I’m not quite ready to publish scantily-clad selfies… so I left my socks on. I’ve a target weight in mind which corresponds to 20-year-old-me and a good photo from 1991. 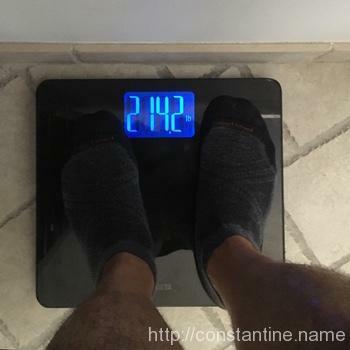 This is the least I have weighed in 20 years. About 55 pounds (25kg!) lighter than 2008. A visiting Finn mowed my lawn for me yesterday, and so I had time for one last run on this continent before I leave for a triple-stop Parkour trip in about twelve hours. The graph is a little odd because I didn’t stop the tracking immediately, so there’s a huge bar for the last split (not shown.) 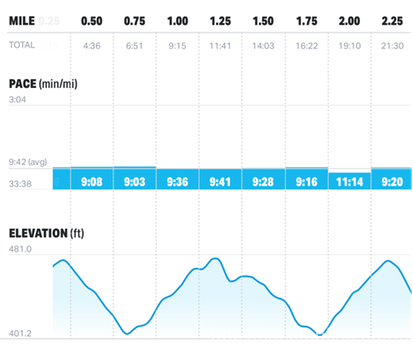 It’s a lollipop route, so the 11-minute split is up the slight hill which I ran down at ~9-minute pace. The whole run came in about 9:33, which is right on the fastest I’ve ever run this. This time was much more uniform in pace than the last time I ran this. Why do I post this stuff? Because whomever you are, whereever you are in your physical fitness (or complete lack thereof), you can simply do what I did: Start where you are.